Description Get over 25% discount on this special WUNDER2 D-FINED EYE COMBO. Get one each of WUNDEREXTENSIONS LASH EXTENSION STAIN MASCARA, WUNDEREXTENSIONS LASH EXTENSION & VOLUMIZING MASCARA & WUNDERBROW D-FINE (available in 3 shades). Create natural or dramatic lashes to suit your mood! Here’s how: NATURAL LASHES Use WUNDEREXTENSIONS LASH EXTENSION STAIN MASCARA on clean, dry lashes. Apply one coat from root to tip for a natural lash look that lasts up to 72 hours on the lashes. If you like to wake up with rich color on your lashes but still want to use something dramatic, this mascara makes the perfect base! 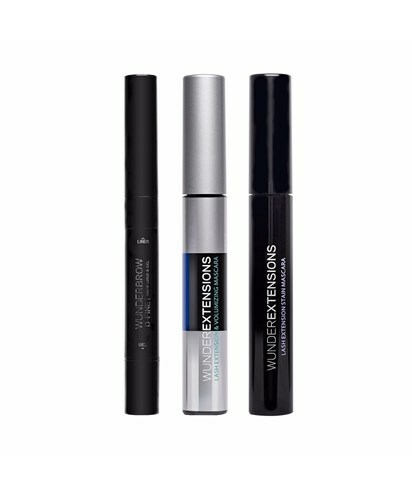 DRAMATIC & HYDRATED LASHES Use WUNDEREXTENSIONS LASH EXTENSION & VOLUMIZING MASCARA on clean, dry lashes. Brush from root to tip until you have achieved desired lash volume and length. This mascara is designed to hydrate and add extreme volume with one stroke of the brush. TIP: Use both mascaras together for long-lasting color & drama! Apply the STAIN MASCARA first for color that lasts up to 72 hours. Then apply VOLUMIZING MASCARA for length, volume & drama! Frame your beautiful lashes with some PERFECTLY SHAPED BROWS! Here’s how to use WUNDERBROW D-FINE: Use the angled Brow Liner through the front of the brow to create natural looking definition, then shape and sculpt the tail-end of the brow. Comb through the brow with the Tinted Soft Hold Gel to groom and set the brow and liner product.